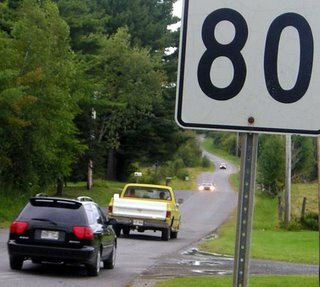 Some of the worst roads in the region have the highest speed limits while some of the best, most recently paved, straight routes have such slow speed-limits that it seems the highway department installed speed limit signs in the area based on the Richter Scale rating of the road! Take Lakeside for example. After turning off of Highway 10 at Exit 90 towards Knowlton many people have found themselves being pulled-over for breaking the posted speed limit but this isn't really much of a surprise since the only way to keep under the speed limit on Lakeside is to keep one foot on the brake! For some reason the speed limit on this smooth, wide, well marked stretch of road leading into Knowlton has a maximum speed limit of 50 kilometers per hour. Granted, there are some areas with many closely spaced lakeside properties that warrant such a slow speed due to the telephone posts planted in the curbs, but much of the road is so straight and that if you do respect the speed limit you will likely find at least a half-dozen cars riding your tail! What doesn't seem to make sense is that on the extremely poor, winding and dangerous Frizzle Road, the posted speed limit is 80 km/h and the rough state of the road makes it almost impossible to even attain that speed since there are such twists and turns in the road not to mention the blind driveways with tractors and farm machinerey often turning onto the road as well as hills and blind corners! Trying to drive this route at 80 km/h seems excessive while trying to drive Lakeside at 50 km/h seems ridiculous. Frizzle has almost no dividing lines visible and the potholes are worthy of a Montreal suburb's streets during a blue collar workers strike yet Lakeside is freshly paved and has new bright lines on it but we are forced to crawl along Lakeside at an achingly slow pace or risk a ticket. The traffic in Knowlton village itself seems to be an arbitrary decision as trucks and visiting traffic comes barrelling East on the 104 rarely acknowledging that a town with pedestrians even exists and what about the cars that roar up Victoria oblivious of the daycare as if the road was a time-trials race-course. The school on Knowlton Road, while it has posted limits of 30 km/h, is lucky if traffic speeds dip below 50. Thank-goodness city hall put up some new stop signs in town to reduce the maximum speeds that were previousely possible but where is the law enforcement? Police presence to enforce traffic speeds is noticeably absent from the village of Brome Lake and instead seems to prefer to hover on Lakeside where it is almost impossible for drivers to maintain such a ridiculously low speed-limit and thus makes it easier for the police to give tickets. The traffic police seem to ignore the downtown area where everyday there are large trucks breaking the speed limit and residents who take advantage of some straight stretches of roadway in Knowlton to test the limits of their vehicles by exceeding safe speeds. If the local transport department could analyze the traffic and road conditions properly and then apply an appropriate speed limit to these sections of road then it would avoid un-neccesary accidents...not to mention speeding tickets that are perhaps un-deserved.